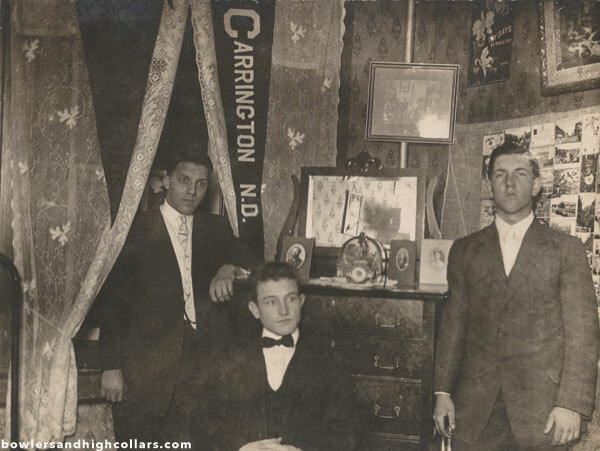 Carrington, North Dakota, university students. RPPC. Private Collection. And you have the lace curtains on the window along with their two banners, one facing indoor and the other facing outside for everyone to see. The last word on that one looks to be Merris. The RPPC is divided with no stamp box. I believe this was taken in the mid to late 1900s. This entry was posted on Wednesday, December 16th, 2015 at 12:48 pm	and tagged with 1910s, Carrington, fraternity, North Dakota, room, student, USA and posted in Groups, RPPCs. You can follow any responses to this entry through the RSS 2.0 feed.